HomeAll Posts...What’s So Special about the Arba’een Walk? With all the love and devotion we unconditionally have towards Imam Husain (a.s.), we still at times face misconceptions that could trigger questions, doubts or objections. It’s always healthy to act upon our urge in finding valid information and investigating into things in order to bring about a stronger conviction in our faith and in the rituals we practice as Shi’ah Muslims. Some misconceptions are innocently put forward with a genuine interest to find ways of explaining what we do and why. Some are purely based lack of knowledge, and some intentional with malice goals and camouflaged in a variety of ways. The skill we must adopt is not only to invest in time and effort to build a strong ideology through education and learning, but to also learn how to decipher theories and avoid being caught in dangerous snares of the enemies of Ahlul Bayt (a.s.). In most times a misconception is concealed with a glittering attractive cover. It’s the only way that draws your attention, and maybe even convince you. It usually starts off with a premise you find to be sensible and correct, but concludes in something unorthodox or against our mainstream belief. 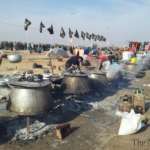 An example for this, relevant to our topic is: With all this poverty and hunger in the world, why don’t we feed them instead of giving all this food to the people walking towards Karbala. The beginning of this sentence sounds perfect, and very flowery, but then why dishearten those who wish to serve the Zuwwaar food? Such statements are increasing, with some falling into ifraat or tafreet. These might not be things that we come across regularly, and it might even be the mindset of a very small minority, but we all need to at least be alert and aware to safeguard ourselves and promote the balanced Islam that represents Ahlul Bayt (a.s.). 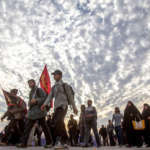 As for the “walking” towards Karbala, especially on the occasion of the Arba’een of Imam Husain (a.s.), it has always been targeted in different ways since the tyranny of Bani Ummayah. These campaigns manifest in different ways, from banning the Ziyarah, suppressing the Zuwwaar, terrorist attacks against the pilgrims, or verbal statements of discouraging and devaluing its significance. What’s the purpose of this Arba’een walk? So many people don’t go to work throughout this season! Why does the whole country have to halt just for the “walk”? Even though visiting Imam Husain (a.s.) is recommended, there’s nothing said about “walking” to him! Walking for such a long time harms your feet and back!! When you are walking there is a lot of mixing between the genders, as there are no barriers, and therefore if we say it’s not haram, it’s better for women not to go. Look at all the money that is spent in these few days, and all the food that goes to waste for people that don’t really need it. Wouldn’t you rather spend that money on going to Hajj, or getting married?? These are some of many misconceptions that are presented in different ways. Let’s say that whatever motive one might have, political or ideological, it does discourage someone from the enthusiastic feeling they should have towards Ziyarah. Answers to these issues can easily be found. We just need to look into this with more depth and focus on the many positive benefits this practice has. Reality of the matter is among the many things Ziyarah is, it is also a thorn in the eye of the enemy who purposely aim to distort its message and objectives. We are yet to truly comprehend the impact our Ma’sumeen (a.s.) have on us. We still don’t know most of the wonders of our Shari’ah. Why is it so recommended to “walk” to the mosque, or “walk” behind a funeral procession, or “walk” your guest out, or even “walk” to Hajj. 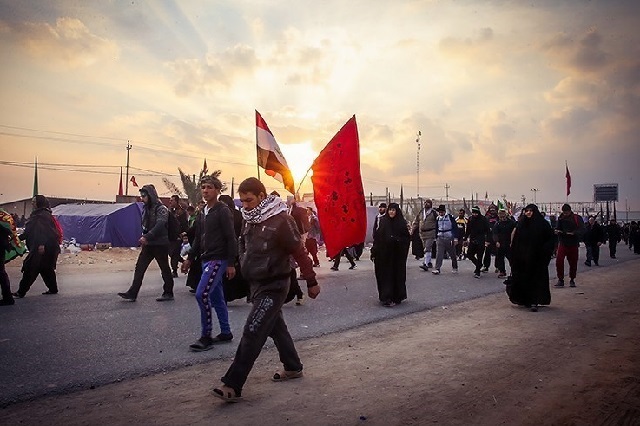 As far as the Ziyarah of Arba’een, there are numerous traditions that use the word mashiy (walking), and no, it’s not because there were no other means of transport at that time. There are even traditions that insist on “walking” and not “mounting,” in using a horse or a camel. Reward for every step taken. Forgiving of sin for every step taken. Elevated a thousand levels for every step taken. The reward of a Hajj pilgrimage for every step taken. The reward of more than a Hajj and an Umrah for every step taken. The reward of freeing a slave from of one of the children of Isma’il (a.s.). Be counted as among the Saliheen. Be able to ask Allah ta’ala anything and receive it. Repelling of calamities and misfortunes. Granted increase in money and sustenance. 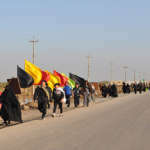 The Arba’een walk of Imam Husain (a.s.) not a normal event. It’s not a carnival or a festival. It’s beyond and above all that. Extensive research has been done on this with detailed analysis of hadith. For example see: Al-Ghuraifi, Seyid Mahmud al-Muqaddas. Al-Sayr ‘ala al-Aqdam ila Karbala al-Muqaddasah (Karbala: Markaz Karbala lil Darasaat wa al-Buhuth, 2018).